You’re a carpenter working alongside your father in Washington D.C. One day a man walks up to you, says he represents the president, and offers you $500 to be his stand-in. What would you do? If you’re thinking of the movie Dave, the 1993 comedy of a man who looks like the president and fills his shoes when the real president has a stroke, think again. This is a stand-in role that could cost you your life. At the outbreak of the Civil War, no one expected a long war. The North was convinced they would quickly beat the South, and the South was convinced they would beat the North. Only it didn’t work out that way. Lots of men on both sides signed on for the war, but the enthusiasm for the glory of battle quickly waned. Between soldiers dying and enlistments coming to an end, both sides were hurting for replacement soldiers. By 1862, the South had ordered a draft, eventually enlarging the pool of draftees to men between the ages of 17 and 50. The North followed suit with a draft in 1863. But there was an exception. Any man who was unable to serve—or unwilling—could pay $300 (over $4500 in today’s economy) or get someone to serve in his place. This wasn’t popular with the poor or working class, but the Union desperately needed soldiers. President Lincoln was already serving in the sense he was the commander-in-chief–but he wanted to set a good example, so he chose John Staples, a Washington D.C. carpenter. 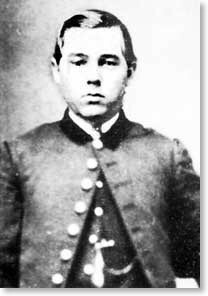 On October 1, 1864, Lincoln’s representative approached the young man with an offer. Staples said yes, and he went to serve in the Union army as a stand-in for Abraham Lincoln. Before we dismiss Staples as a naive 19-year-old simply eager to see battle, this was not his first time to serve in the army. He had already served, but a bout with typhoid fever sent him home with an honorary discharge. Knowing what he could face, Staples willingly stepped in as Lincoln’s substitute. We face a battle daily—a battle with temptation and sin—and in spite of our best, heroic efforts, it’s a battle we will lose. Sin defeats us. “Indeed, there is no one on earth who is righteous, no one who does what is right and never sins” (Ecc. 7:20). Jesus Christ willingly stepped in as our substitute. He fought the battle of sin for us. And won. He died in our place, but God raised Him from the dead. He is alive and death is defeated. And because I accepted Him as my substitute, I too am alive. “But thanks be to God! He gives us the victory through our Lord Jesus Christ” (1 Cor. 15:57). Well said, Lynn. Yes, praise be to God.